VINTAGE BEECHAM. HANDEL: "Solomon': The Arrival of the Queen of Sheba. DVORAK: Legend Op. 59 No. 3. OFFENBACH: Suite from: 'Tales of Hoffmann'. BIZET: 'Carmen'-Suite. DELIUS: 'La Calinda' from: 'Koanga'. MENDELSSOHN: Music from 'A Midsummer's Night Dream'. STRAUSS: Voices of Spring. BORODIN: Prince Igor - Excerpts. 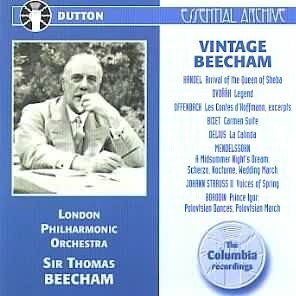 London Philharmonic Orchestra Sir Thomas Beecham Dutton Laboratories CDEA5022 [73m] ADD. Listening to these types of CD's makes one forget the primitive and limited sound, only to gorge oneself onto music making that is no longer with us. This CD is indeed 'Vintage Beecham' as it enshrines some of the most popular lollipops that were to make this conductor's concerts such special occasions over the years. 'The Arrival of the Queen of Sheba' bristles with life with the seductive LPO woodwinds in full flight like a team of birds! On the contrary the plain wistful melody of the Dvorak legend has the orchestra in clearly meditative mood. The excerpts from Offenbach's 'Tales of Hofmann' are also winningly done with a suitable hustle and bustle about the Barcarolle, one of the finest moments in Beecham's recorded legacy. The conductor's 'Carmen' Suite was also a similar show-stopper and the lazy Iberian evocations come to such vivid life in his hands, that one is almost tempted to take a trip to Spain in virtual terms. This 1939 recording is one of the best in the collection with ultra smooth surfaces and occasionally quite impressive bass and midrange frequencies. Delius could never fail to appear in any serious Beecham program and this early 'La Calinda' dances along with much greater presence than the later more famous stereo account. Another favorite Beecham composer was Mendelssohn who was a regular feature in most concerts conducted by the aging conductor. These 'Midsummer' excerpts are full of silk and gossamer, an ethereal nocturne, an earthbound Scherzo and finally a suitably swaggering Wedding March that transcends the sixty odd years of the recording! The same goes for Strauss' characteristic 'Voices of Spring', a rare item in Beecham's recording career. The programme could not have ended with a better item, Borodin's 'Polovtsian Dances', a tribute to the diversity and eclectic temperament of this charismatic conductor. It is also captivating to note that Dutton have retained Lyndon Jenkins' original essay in this reissue, an unmissable portrait of this genial man. A true treasure and now available at budget price, an added incentive to harder-up collectors to sample the Beecham magic!